Israeli emergency response group continues its mission to locate remains of Holocaust victims in Danube and bring them for Jewish burial. 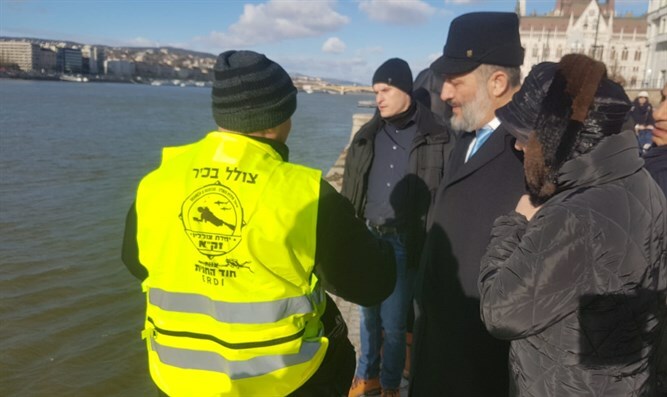 Following three intensive days of activities, the ZAKA Divers Unit delegation has completed the first phase of its mission to locate and retrieve Holocaust victims’ bones from the River Danube in Budapest. This included defining the exact area of the search on the basis of investigative work, scanning the riverbed with a sonar device and integrated underwater camera, a unique tool that had recently been purchased by the ZAKA organization. The images and sonar scan results will now be examined and decoded and, based on the results, the continuation of the mission will be determined. The ZAKA Divers Unit has been researching the project for four years, alongside diplomatic activity that resulted in the Hungarian government supporting the mission to do everything possible to locate and retrieve the bones of Holocaust victims in the River Danube. It is thought that, despite the passage of more than seven decades, there is a strong possibility that the bones can be recovered and brought to burial in accordance with Jewish law. As soon as the approval for the mission was given, an initial delegation from the ZAKA Divers Unit, headed by ZAKA Special Units Commander Haim Outmezgine and including a sonar specialist and a specialist in complex underwater searches, arrived in Budapest to present the search plans to the relevant officials.